I encourage you to join in. 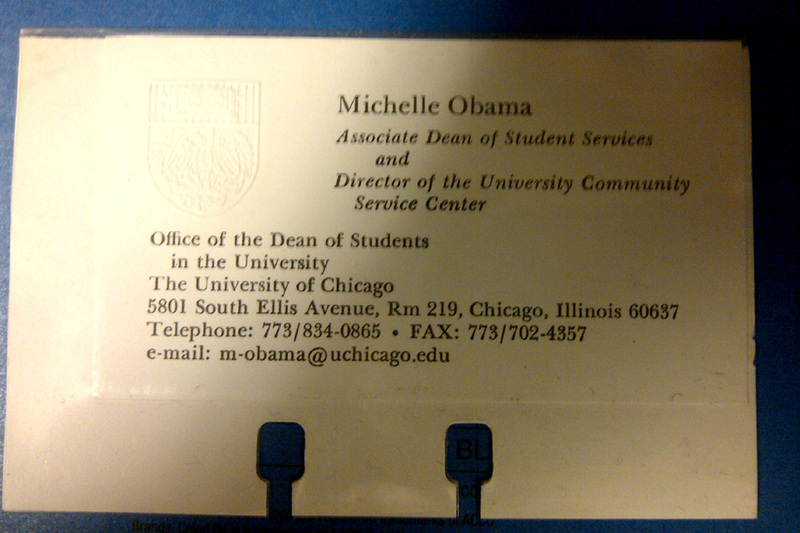 I met Michelle Obama in the mid 1990s when she was at the University of Chicago and Barack Obama when he spoke at a Tutor/Mentor Leadership and Networking Conference in May 1999. They both were introduced to the Tutor/Mentor Connection (1993-present) and its ideas, which I borrowed from how companies support multiple stores from central office teams and how United Way campaigns depend on CEOs of major companies asking leaders of other companies to run campaigns and make personal gifts. 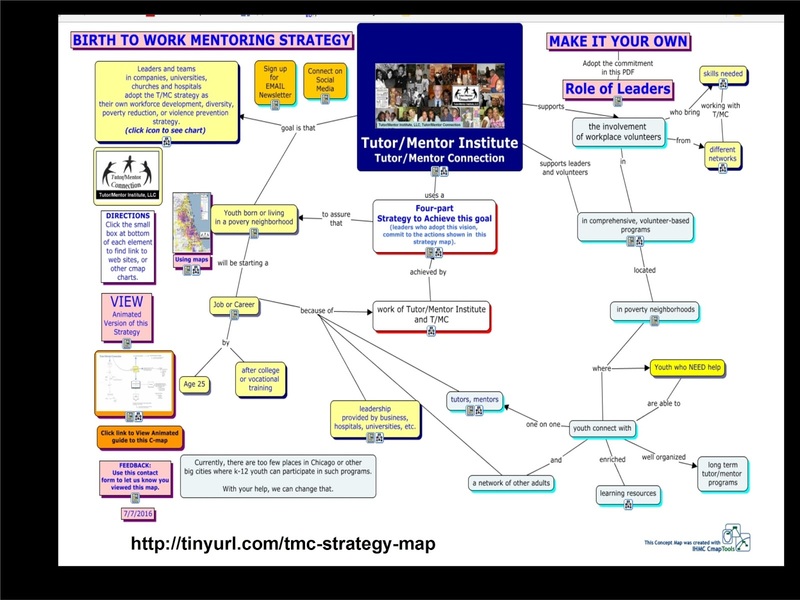 Since 2011, I have led the T/MC from the Tutor/Mentor Institute, LLC organizational structure. During that conference and one before then I was trying to generate "best practice" ideas around topics like recruitment, volunteer training, fund raising and communications, with awards presented at the Conference. 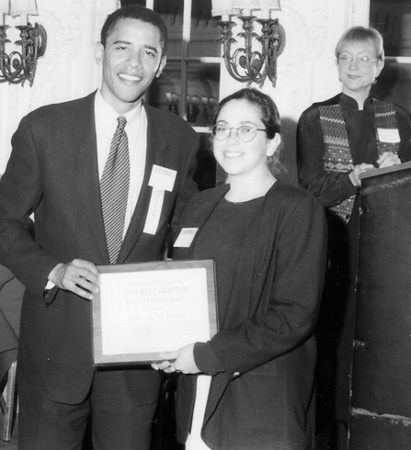 In this photo Barack Obama is presenting an award to a program leader from Quincy, Illinois. In the background is Betsey Densmore, who was the Executive Director of the Chicago Bar Foundation in 1994 when I reached out to create a partnership intended to draw operating dollars to tutor/mentor programs in all Chicago neighborhoods. The Lawyers Lend A Hand Program is still operating today, 24 years later. 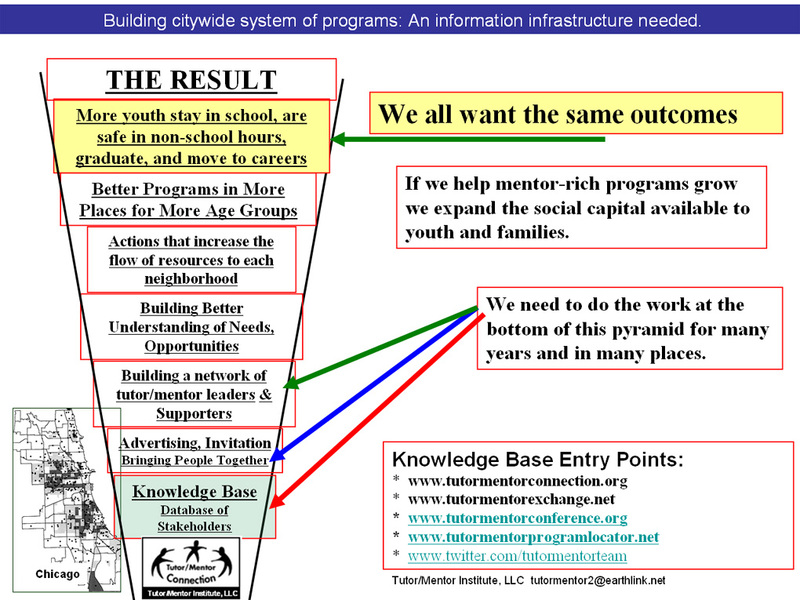 Here's a graphic that I created several years ago to show the year-round attention we need to give to support youth tutor, mentor and learning programs in every high poverty neighborhood of Chicago in order to draw volunteers, ideas and operating dollars to every program on a continuing basis..and to help new programs grow where more were needed. I used President Obama's photo from the 1999 conference to illustrate how people with higher visibility have greater impact and influence than people with less visibility, such as myself. 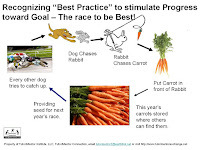 I describe this year-round strategy in this PDF and this video. 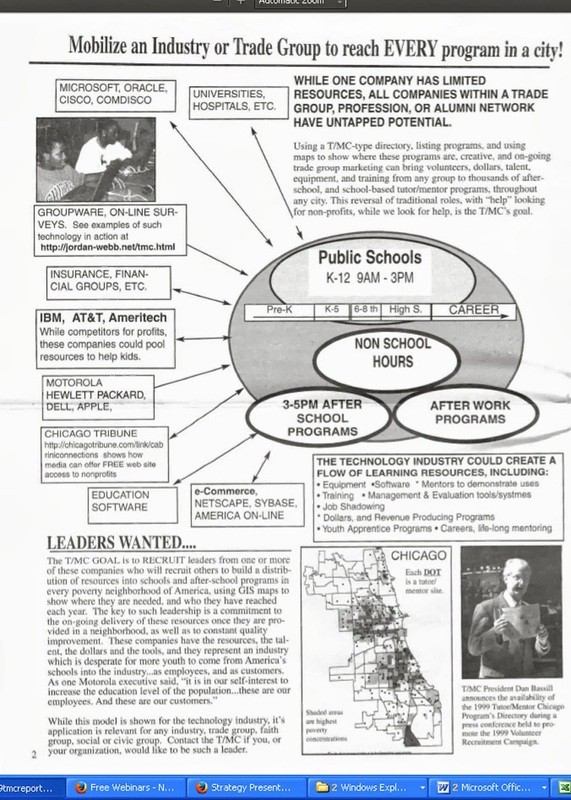 So far I've not seen any leaders consistently use maps, and a data-base of youth serving organizations, the way I demonstrate in articles on this blog and on this page of the Tutor/Mentor Institute, LLC site, yet I've shared these ideas freely for over 20 years, as you can see from this page of a 1990s printed newsletter. Unless some of you share this with others, and duplicate my own efforts, we still may not see leaders take this role in today's Summit or in future years. Unless a few of you provide financial support (click here) I may not be able to continue this beyond 2018. Helping ALL kids through school and into careers. I'm a sports fan, so during baseball, basketball and football season I'm following stories about the Cubs, White Sox, Bulls and Bears, which all focus on a common theme: How can we do this better? Each team is constantly trying to improve, to be great, and drawing on a vast range of resources in this effort. Now let's apply this thinking to helping kids born or living in poverty areas of Chicago and other cities with pro sports teams. 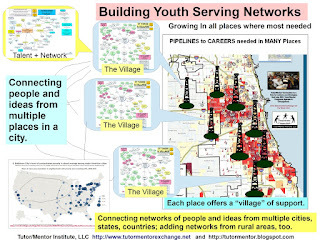 Are there groups of people using graphics and maps like I use in my blogs, with the goal of helping constantly improving youth serving programs be available to k-12 youth in every high poverty neighborhood of each city? This arrow graphic can be seen in the upper left corner. 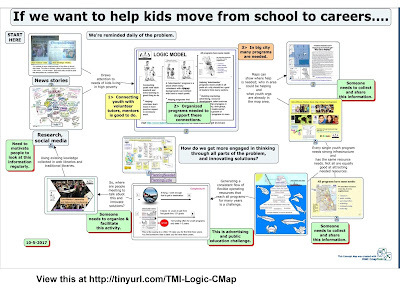 It shows the 20 to 30 year long journey each child takes as they move from birth to work. Kids living in areas of concentrated poverty have too few people modeling the many careers kids might aspire to, or helping open kids move from one age group to another. If you stand the graphic above vertically, it resembles an oil well, or a skyscraper. and emphasizes that the work done in the preschool and elementary school years is essential foundation work that propels kids through high school, college, vocational training and into jobs and careers. Schools and youth serving programs need to be located in every high poverty neighborhoods, providing age appropriate support as kids move through school. 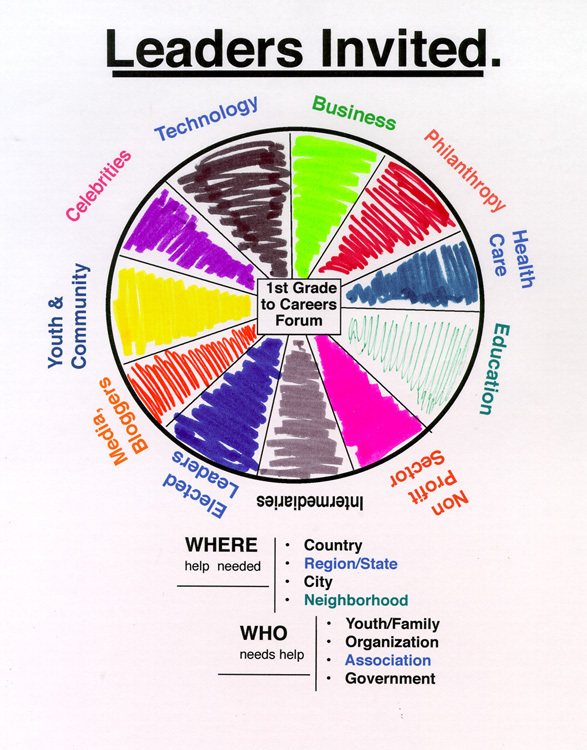 Teams of adults from the community and the larger geographic region, including businesses, faith groups, hospitals and universities, need to be part of teams working to help individual programs grow, and helping many individual programs fill different neighborhoods. All of the articles on this blog and the resources on the Tutor/Mentor Institute, LLC web site are intended to support groups of people who are trying to figure out "How do we do this better?" There are dozens of business, civic, government and philanthropic groups in Chicago and other cities looking for ways to help reduce poverty, violence, inequality while improving working conditions and preparing people for the workforce. The information I share can be used by any of them. I'm not sure most of them even know I exist. As you watch pro sports today, I hope you'll spend some time thinking about this. I'd like to be a coach and mentor to help you and your team dig through the massive playbook that my web resources represent. If you are part of some of these planning groups, or know people who are involved, please pass on an invitation and encourage them to read some of the articles I've posted. Connect with me on any of these social media sites. 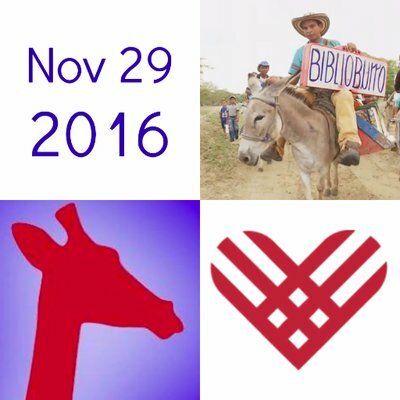 Nobel Prize, Giraffes and Tutor/Mentor. What's the Link? I wrote this article in 2006 and thought I'd update it today. There was much jubilation here at the news last week that Muhammad Yunus (www.grameenfoundation.org ) had won the Nobel Peace Prize for 2006. Yunus was commended as a Giraffe way back in 1987. He follows Giraffe Wangari Maathai (www.greenbeltmovement.org) , who was commended as a Giraffe in 1990 and won the Nobel Peace Prize in 2004. We happily suggest that the Nobel Committee check our files now for potential future winners. What's the connection? 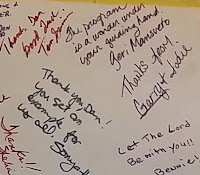 Daniel F. Bassill (that's me), founder and president of Cabrini Connections and the Tutor/Mentor Connection (T/MC), was commended as a Giraffe in 1997. I've been proud to wear the Giraffe pin on my coat for almost a decade. I keep telling people that we can earn awards like this, if they will join me in the efforts of the T/MC. Over the past couple of days, I've been talking to Phil Cubeta at GIFT HUB and Sean Stannard-Stockton at tacticalphilanthropy.com about ways generous acts of kindness can add up as strategic, long-term support of non profits working to help kids grow from first grade to first job, or working to help solve other long-term challenges. My goal is to use maps, databases, the Internet, and social networking/collaboration tools to draw donors and volunteers to maps where they see where the need for charity dollars, or volunteers is, and choose among many agencies to decide who to help, and how much to help. By using information as a middle man in this process, we can improve the distribution of support to all places where help is needed, and sustain it for the many years it takes for organizations to grow from good to great. If we can make this work, I think it deserves a Nobel Prize. While I've not received a Nobel Prize or MacArthur Foundation Genius Award, here's a list of recognition I have received. That's what I wrote in 2006. Much has change since then in my ability to do this work, yet my vision is the same. 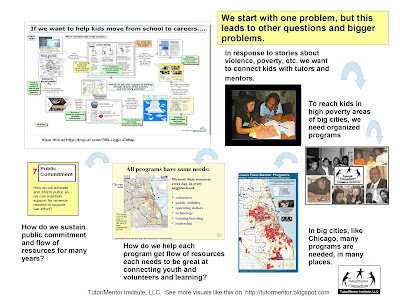 A few years ago I created this graphic to show the obstacles that have contributed to my inability to fully develop my vision for using maps and building a community of support for well-organized, non-school, tutoring, mentoring and learning programs in all high poverty areas. You can see several dips on this time line. The 2008 financial sector melt-down ultimately caused me to separate from the Cabrini Connections tutor/mentor program and form the Tutor/Mentor Institute, LLC to continue doing this work. I continue to believe that there are people in the world who would support my work, partially fueled by stories of multi-million dollar donations to local universities. In 2008 I wrote this article, following news of a $300 million donation to the University of Chicago by an alum. This week I'm reading about another huge donation to the University of Chicago. That tells me the money is out there. I keep sharing this graphic, which illustrates how people who read my blogs could be passing on what they read to people in their own network, via social media, traditional media, phone and email and plain old fashion one-on-one conversations. 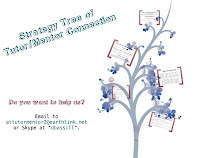 Using the six degrees of separation rule, that means that the people they know, who also share this information, will ultimately reach someone with very deep pockets who is interested in investing in the Tutor/Mentor Connection and completely upgrading it for the next 20 years. Maybe he/she will win the Nobel Prize as a result. Take a Look. Create Your Own Version. Pass it on! I've been sharing ideas using Power Point/PDF presentations and printed newsletters for more than 20 years. Since 2005 I've been using this and other blogs for that purpose. And I've been encouraging others to look at what I do, then create their own versions. That's what Kevin Hodgson, a middle school teacher from Western Massachusetts did this weekend. 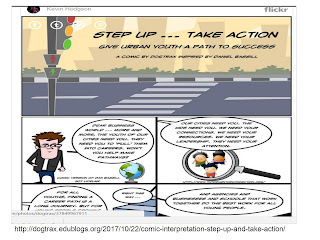 Kevin took time to look at this Role of Leaders pdf, then created a comic strip, with his own interpretation. The image above is from a cartoon you can see in full on his blog. So how did we get to this point? 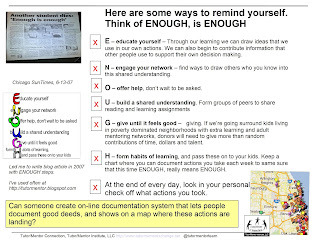 I joined Kevin and other educators in 2013 for a Connected Learning MOOC (#clmooc), and I've re-connected every year since then, using my blog posts to introduce work I was doing and to encourage them to involved their own students in doing this work. Browse the #clmooc tag and you can see past articles. I'd love to find someone(s) who would re-do ideas I share at https://t.co/85UGitcYDB in cartoon/comic format. Apply to any city. it seems to be about personas. Comics appeal to the storytelling by relating to a person in the map. then, others in #clmooc group passed on Kevin's Tweet, adding some kind words endorsing my efforts. Interns from various universities in the US, South Korea and other countries have been looking at my ideas and creating their own interpretations for many years. In 2013 I asked two interns to look at work others had done in previous years. He created this graphic and used it in this Prezi presentation. You can view the collection of intern work at this link. 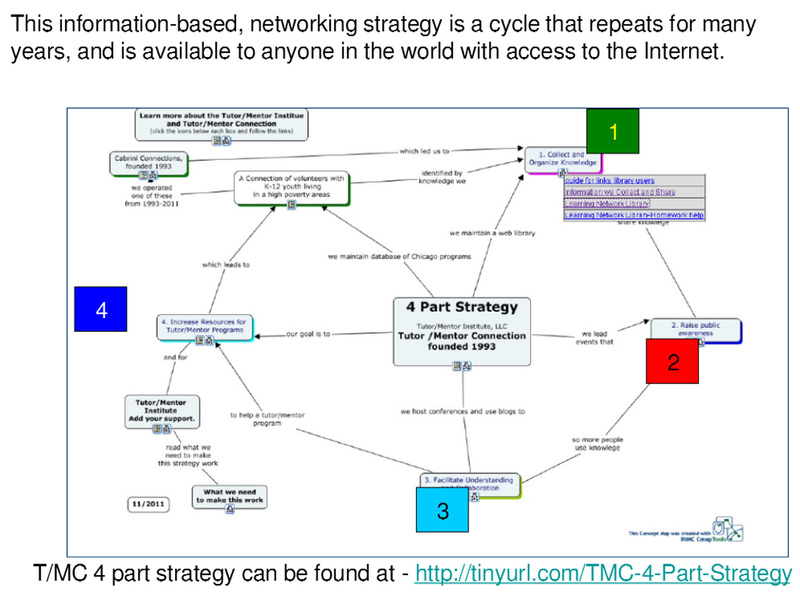 When people like Kevin and others in networks like #clmooc begin to look at my articles, then create their own interpretations, they are building their own understanding and passing on the ideas to people in their own networks. 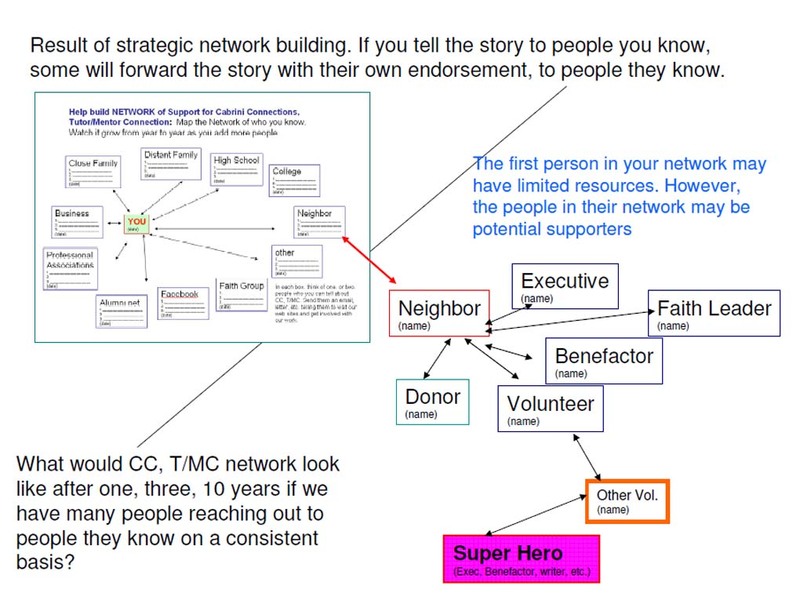 This graphic illustrates how this network-building and idea sharing can ultimately lead to people with greater wealth, power and influence looking at the ideas and adding their own support. We need to find a lot of these people....in Chicago and in every other city. If you'd like to help me continue to do this work, create your own interpretations, or visit this page and give your financial support. I have written many articles over the past 12 years, focusing on the role hospitals could be taking to reduce inequality, improve public schools, lower health care costs and draw more young people into health care careers. Here's one article. Find others by clicking the #publichealth tag at the left. In many of these I'm pointing to articles and research written by others to support my efforts to motivate hospital leaders to take on a broader set of goals (and to invite me into their conversations). Today I was pointed to an article titled The Often Overlooked Solution to Income Inequality, which shows that hospitals, as the major employer in many inner city neighborhoods, could take on a much broader set of goals "to help make cities truly livable". 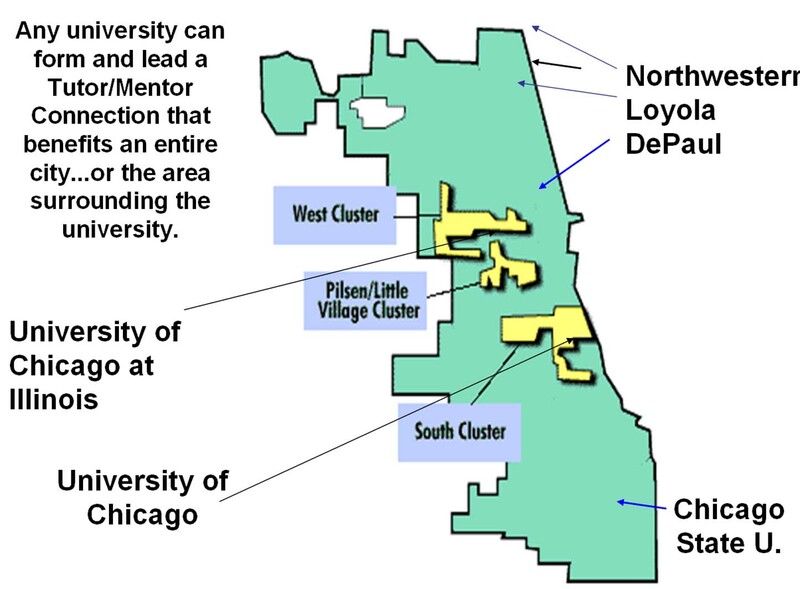 Below is a strategy plan template that was started by a team of DePaul University grad students in 2001. I've updated it a few times since then. If you're involved with leadership at an urban hospital or teaching university I encourage you to use this and other articles I've written to stimulate thinking and discussion of strategic goals for your institution. Over the past few years I've written posts following the annual #onthetable event hosted by The Chicago Community Trust, in which people get together in small groups to discuss issues important to them. Last night a friend asked me if I knew of David Gurteen, while we were talking about the knowledge base I've been building since the mid 1970s. He sent me the link today and I took a look at the Knowledge Cafe's which David has been supporting. As I've looked at these I have felt that something was missing. Below are a few graphics that show my thinking. 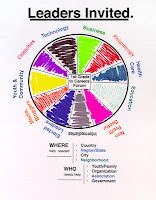 The first is a planning cycle graphic which you can see in this blog article. The #onthetable events and Knowledge Cafes would be part of the middle steps on this graphic. At the left would be a knowledge base, including maps, that people draw from to be better informed about problems, and potential solutions, when they get together to talk. If people come together without any specific issue in mind, the talk could be random and cover a wide range of topics. 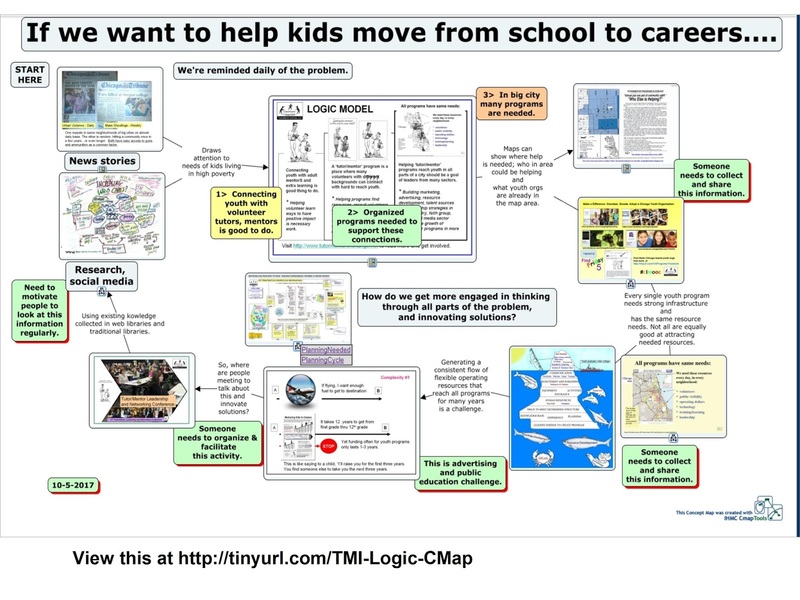 I use graphics like the one below to focus on one issue: How do we assure that kids born in high poverty areas today move safely through k-12 and post high school learning and into jobs and careers and adult responsibilities? I posted an article earlier this year showing the different components of this pyramid. In the middle of this the steps are "creating a better understanding" and "creating actions that support the operations of needed programs in all places on the map where they are needed". These two steps would be well supported by #onthetable and Knowledge Cafe processes, if they were focused on single issues. At the bottom of this pyramid I focus on the knowledge base, or library of information and ideas, that people need to use to expand their understanding of the problem and solutions. 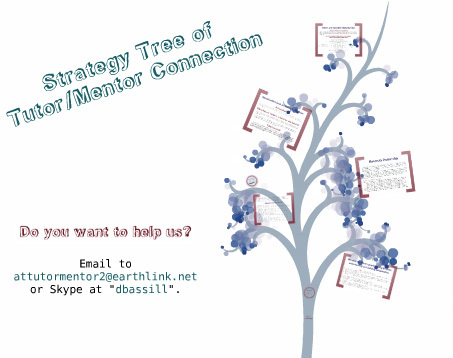 I have been building a knowledge base to support this process since I started leading a tutor/mentor program in 1975. It's been growing on the Internet since 1998. This map shows the four sections. I'd like to find concept maps and visualizations like this on web sites of people who are facilitating conversations and looking for solutions to complex problems. In one section of my library I point to blogs written by many others, and to places like G+ communities, cMOOCs, etc. where people are archiving what they learn in events they are part of. This archiving of information should be a regular part of the process, so that each future gathering and conversation builds upon what has already been discussed and learned by others. The graphic at the right, showing a carrot, represents the ideas in a knowledge library. View this presentation to see my interpretation of this. What do you think about this? 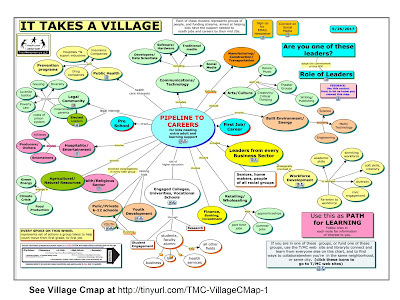 Do you find many web sites where event organizers and discussion leaders are mapping their process and pointing to knowledge bases where people can learn more about problems they are interested in solving? Connect with me on one of these social media places or share your ideas in the comments to this blog. I attended the University of Chicago Urban Education Institute's To&Through Project's briefing this week and shared some ideas on the MappingforJustice blog site. I hope you'll take a look, and take time to get to know the information on the To&Through web site. In my comments I emphasize the use of maps to show where schools are located, with overlays showing demographics of the neighborhood as well as non-school support organizations and assets, such as business, colleges, hospitals and/or faith groups. There's a strong emphasis on collaboration on the To&Through Project site, engaging members of the community not just people within each Chicago Public School. 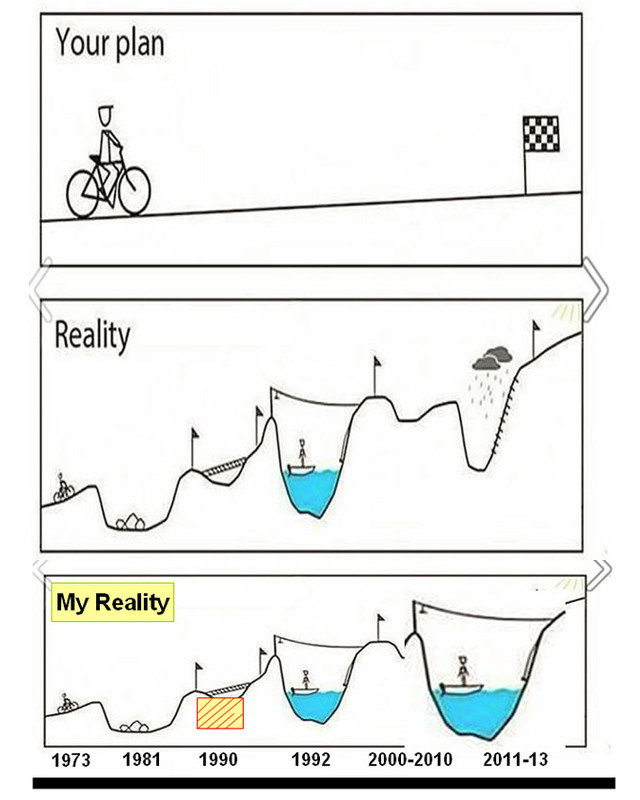 That commitment is visualized with this graphic. To&Through goals are visualized using a time line starting in 9th grade and continuing through high school graduation. The data on the web site for each school shows eight to 10 years of history, showing changes in student success and progression through school from year-to-year. 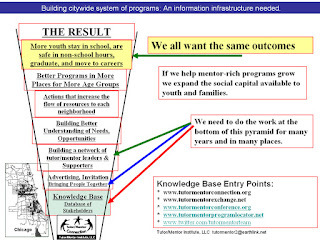 I use a different set of graphics to show the long-term support kids need, starting as they enter school and continuing past college and/or vocational school, and leading to jobs and adult lives free of poverty. 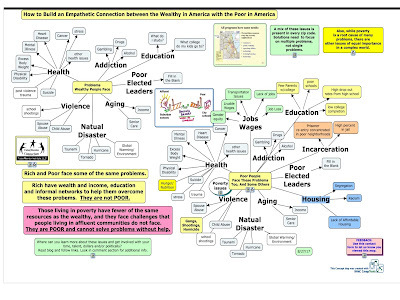 I use geographic maps and concept maps to emphasize the need for great support systems in every neighborhood. 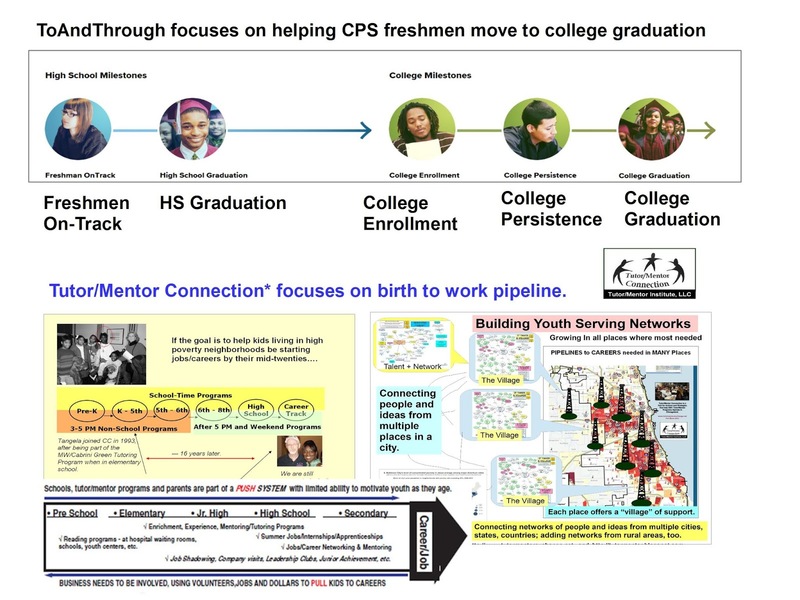 I created the graphic below today to illustrate that the commitment, and actions, leaders need to make and take to help youth move through school to adult lives is the same commitment needed if they were focusing on other issues. Let me break this down for you. 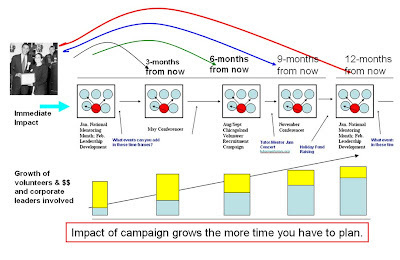 Below is the strategy map shown in the upper left of this graphic. In this blog article I describe this vision and the information shown on this map. 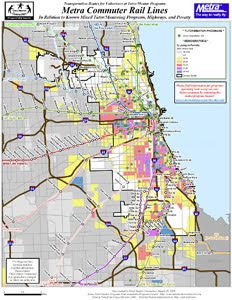 If you open the links under the yellow box at the top left on this map you'll find a village map, which emphasizes the need for leaders in business, religion, higher education, hospitals, media and other sectors to adopt this commitment and help Chicago's kids grow up safely and thrive as adults. However, there are other causes people care about, and similar commitments are needed in each issue area. On the graphic I show above I've enlarged the left part of the Race-Poverty map shown below. Every node on the map represents a complex problem affecting how kids perform in school and affecting people in many parts of Chicago, the US, and the world. 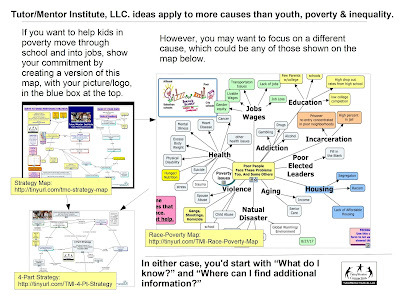 Someone could create a "my goal is" strategy map similar to mine, to show their own vision of steps to reduce these programs and they could share that map on blogs, the same way I do. In every one of these areas, the "what do I know" and "where can I find more information" and "who else is working on this?" questions are being asked. 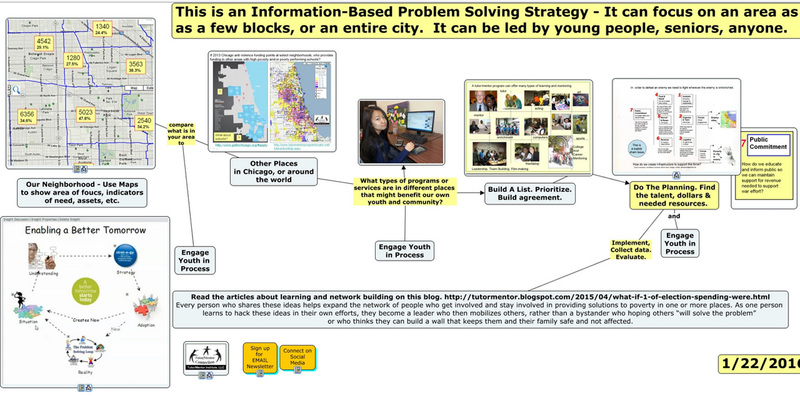 In the graphic I started with I show another concept map in the lower left, pointing to a four-part strategy. You can see the map below and find a description in this article. I have a link to the To&Through project in the research section of the web library I've been building for more than 20 years. 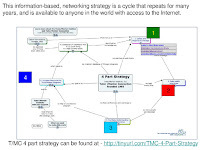 Tha's all part of step 1 of this strategy map. I constantly add new links to the library because new information is being generated all the time. Navigating this is a huge challenge. 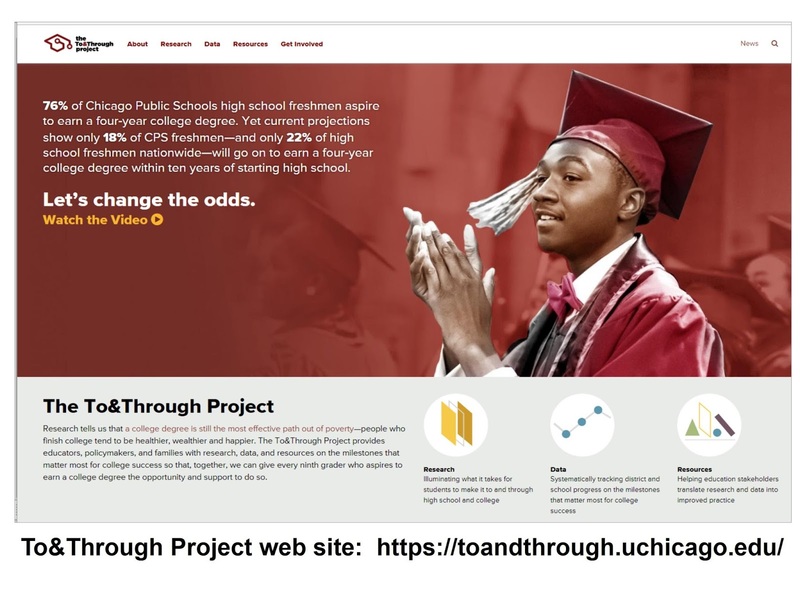 To help more Chicago students move through school, college and into jobs and careers many more people will need to dig deep into this information and find ways they can offer time, talent and dollars in many places. That's step 2 and step 3 on this 4-part strategy. Too few focus on these steps. 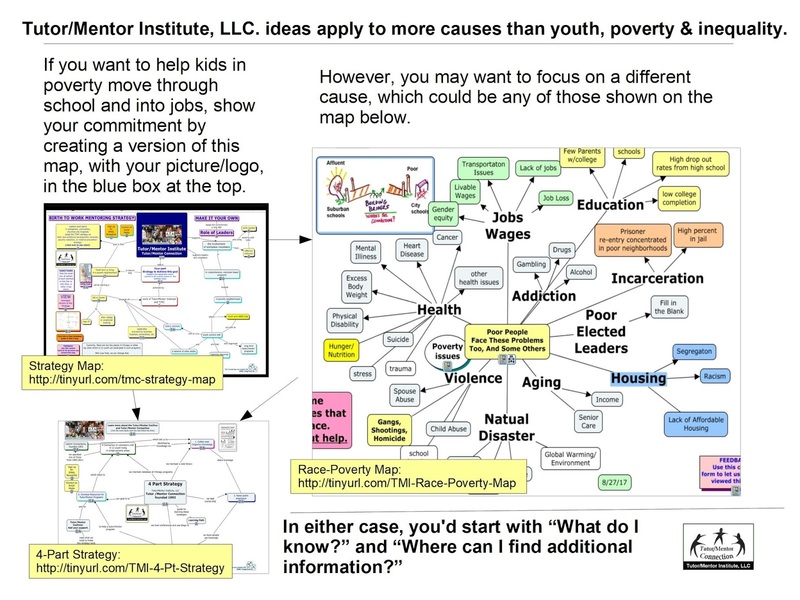 Step 4 uses maps showing where help is needed, where schools and non-school organizations are located and seeks to motivate on-going actions that draw talent, attention, ideas and dollars to each area of the map where indicators show more help is needed. So that leads to one final graphic for this article. Daily media stories and social media posts remind us of tragedies affecting lives of Chicago youth and families. When people read these stories there are steps they can take to be part of solutions. the ENOUGH graphic is described in this article. Would be great if someone would create a data entry form where people could document good deeds and actions they take, and code them by one of the steps shown on my graphic, as well as what address or neighborhood on the map was intended to benefit. Such maps could be on many web sites documenting who's involved and what they are doing and helping people who are involved find and collaborate with each other. Thanks for reading. If you are interested in these ideas I look forward to hearing from you. I've been trying to visualize an idea and hope others will help. In a problem solving cycle people get together to solve a small problem, but find there are other things they need to do to solve that problem, so they reach out for more people and ideas. As they continue to solve the problem, they find more and more challenges. Soon they are thinking of things they never thought about when they first got together to solve what they thought was a simple problem. 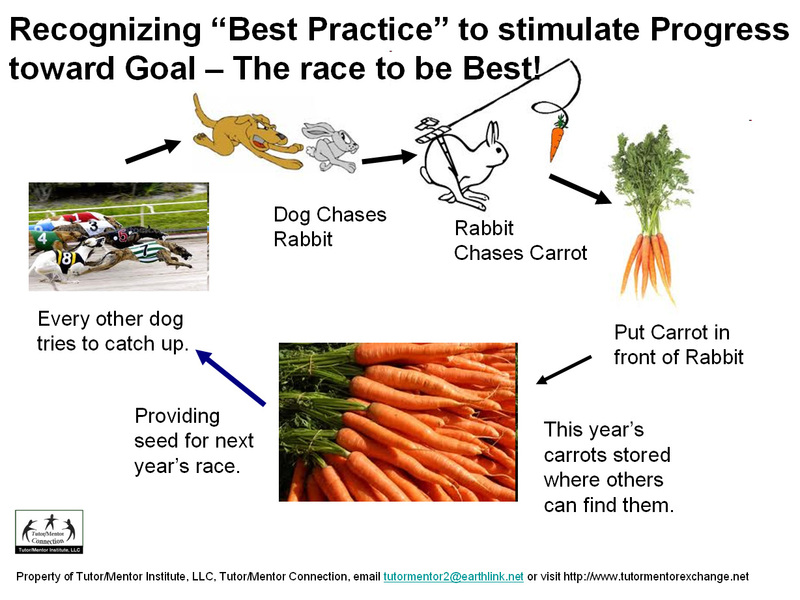 If you want to dig a little deeper into this idea, read this article titled, "The Cyclical Process of Action Research". 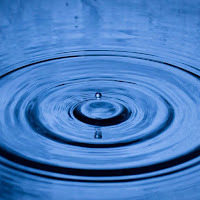 In my mind I see a pebble thrown into water, which creates a ripple around it. As the problem gets bigger, the circle of ripples reaches further. I did a Google search for words "pebble in water ripples" then looked at the images. There are many, each associated with web sites where other people are thinking of this idea and writing about it on their own pages. Plenty to look at. That did not feel right to me, so I use PPT to create the visualization shown below. We start with wanting to connect a youth with a volunteer and over time we're looking at how these programs are inconsistently supported by current philanthropy and government funding processes. Thus programs have trouble becoming great, then staying great over many years. 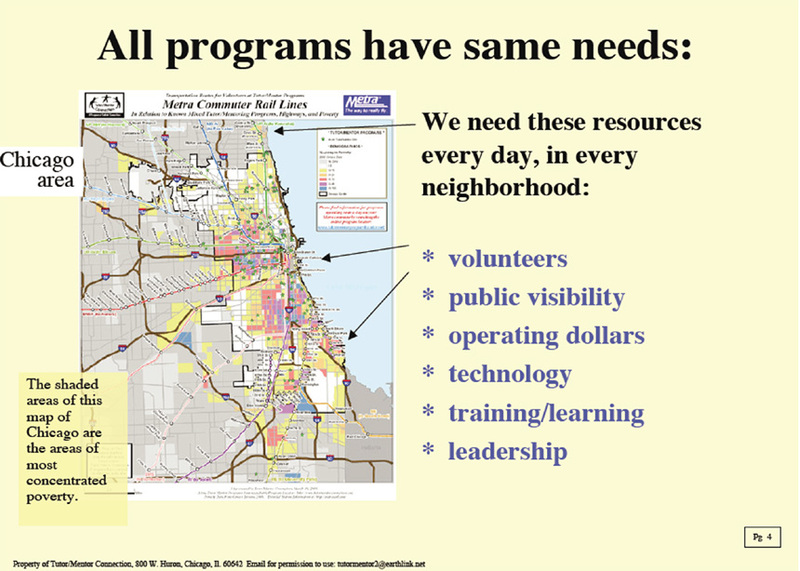 Cities have trouble making needed programs available in all places where the maps show they are needed. Note that at the far lower left, I focus on "public commitment". One of the problems I and others have is attracting viewers to places where we share our ideas, like this blog, and places where we can get to know others who are concerned with the same issues. 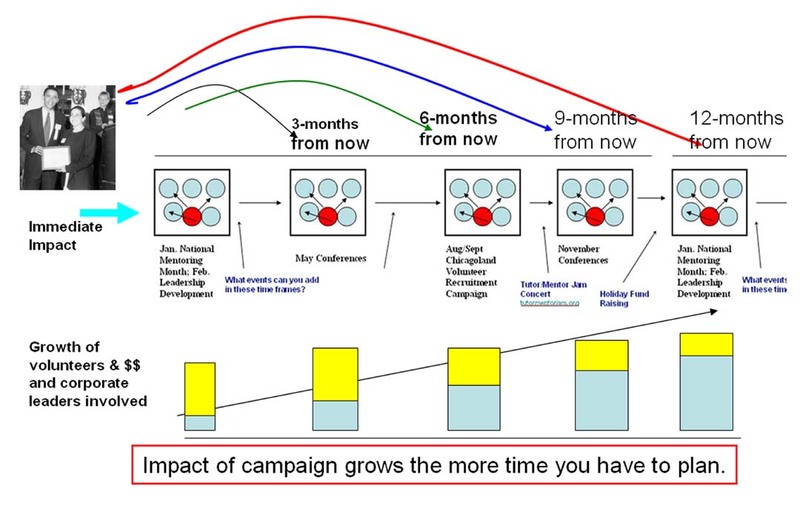 If you're a visual thinker I encourage you to create your own interpretation of this process. Or if you know someone who already has done this, please share the link or visual as a comment. 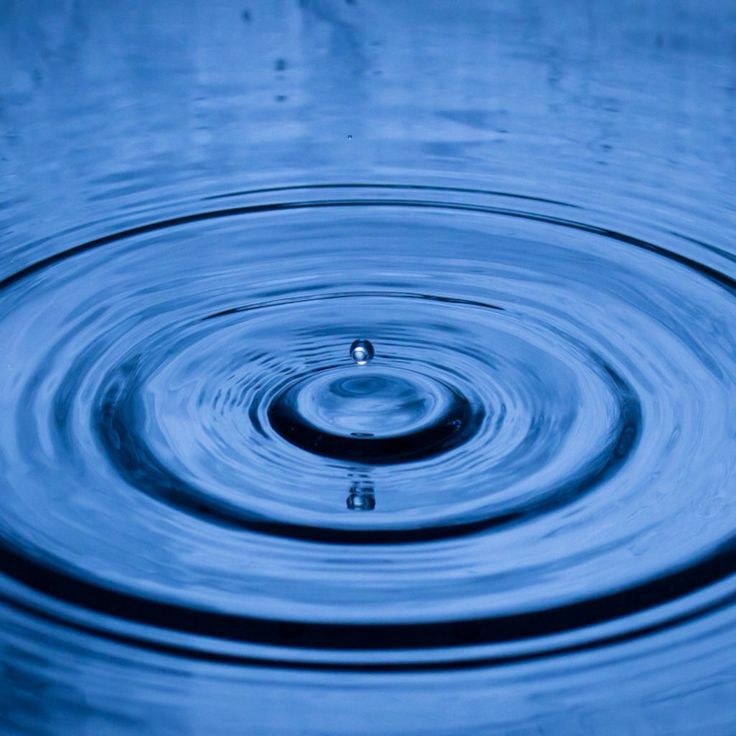 While I found many articles in my "pebble in water ripples" search, I'm not sure how many, if any, focus on the same problem I'm trying to visualize. I hope you will pass this on and that you're part of a team of people who are exploring these ideas. Connect with me on one of these social media spaces, and if you're able and willing, add your financial support to help me do this work. Don't drive by poverty. Get Involved! 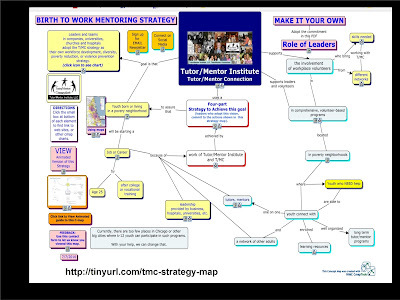 From 2008 to 2010 the Tutor/Mentor Connection (T/MC) was able to employ a part time GIS specialist, Mike Trakan, who created maps for me, and wrote blog articles showing the content of the maps and how they could be used. In 2009 Mike created two maps that he showed on the MappingforJustice blog. One shows Metra Commuter Rail Lines leading through the city and the other shows CTA lines. On Mike's blog he emphasized how people who work in the city and live in the suburbs, or who work in the suburbs but live in the city, pass through high poverty neighborhoods every day. His message was that volunteers can use the maps to determine locations of tutor/mentor programs where they can spend a couple of hours a week enriching the life of a child, and themselves, instead of fighting traffic. His message is "without volunteers, there are no programs." I want to encourage a deeper level of thinking. The people taking a commuter train or a CTA train or bus through these neighborhoods are often people who lead companies, write news articles, or have been blessed with a great social network that enables them to have a house in the suburbs, or on the Gold Cost, and maybe another in Wisconsin or Michigan. These people are still working. They have jobs. They have the ability to point dollars to programs in high poverty neighborhoods. They have the ability to encourage others to be thinking of ways to help tutor/mentor programs grow in Chicago. 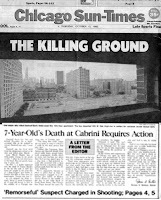 As you're reading your paper the next time and following a story like the one I keep pointing to from the 1992 Chicago SunTimes about the shooting of 7 year old Dantrel Davis, I want these people to be looking at Mike's maps, and thinking, "without operating dollars" there are no programs. Or "without advertising to attract volunteers or donors" there are no programs. Or "why aren't there more programs in the South part of Chicago, or the suburban areas with growing poverty?" 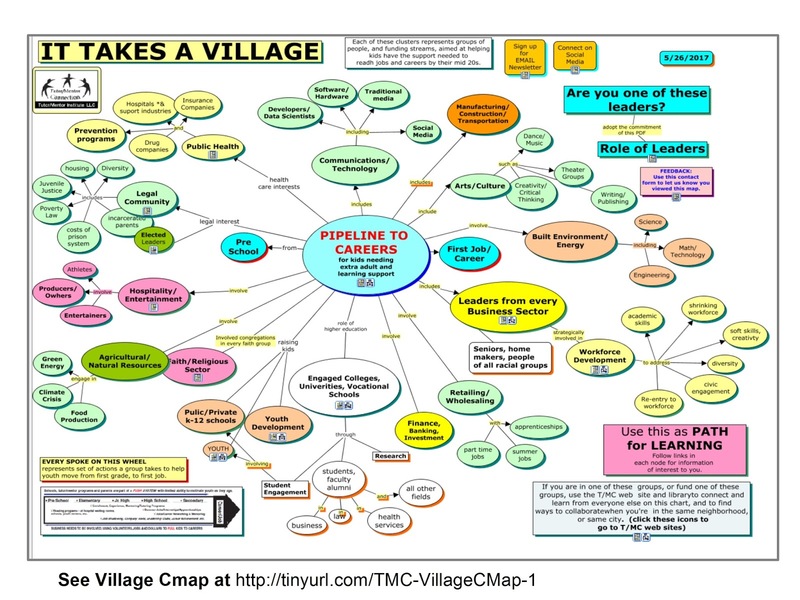 As people who can offer leadership, philanthropy, and jobs programs begin thinking of ways they might help tutor/mentor programs grow, they can use the business maps, hospital maps, or the faith group maps that Mike created between 2008 and 2010, to determine what neighborhoods they want to support, and what programs in those neighborhoods they want to support with annual donations that start now, and repeat each year for the next 10 years. The financial melt-down that started in 2008 had a huge negative impact on the Tutor/Mentor Connection. We started developing the interactive map-based Chicago Tutor/Mentor Program Locator in mid 2009, using the same $50,000 gift that we used to hire Mike, but when this gift did not repeat, and other funding dried up, we were not able to finish the work we were doing. We could no longer pay Mike by late 2010 and he left our staff. Then in 2011 the Board of Directors voted to cease support for the Tutor/Mentor Connection completely, and in a staffing agreement with the Board, I resigned and created Tutor/Mentor Institute, LLC, to try to continue the work of the T/MC under a different financial structure. Since 2011 I've continued to add articles to the MappingforJustice blog, using the Interactive Program Locator to create map stories, and pointing to mapping platforms being created by others in the US and around the world, which can also be used to create map stories. So far, I've not succeeded and the Program Locator census, schools and boundary data has not been updated since 2010 and the info on programs has not been updated since 2013. 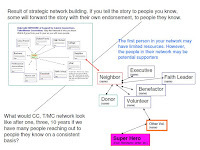 While I keep looking for partners, investors and volunteers to help me with this work, I also look for others who agree with the vision and information-based strategies I've developed since 1994 and want to partner and help re-do the T/MC with new technology, ideas, resources and energy. The problems of 1993 are still with us in 2017. If you'd like to connect with me, find me on one of these social media sites. Last week my #clmooc friend Simon Ensor, a professor in France, posted article with title of "Seeds for Change". 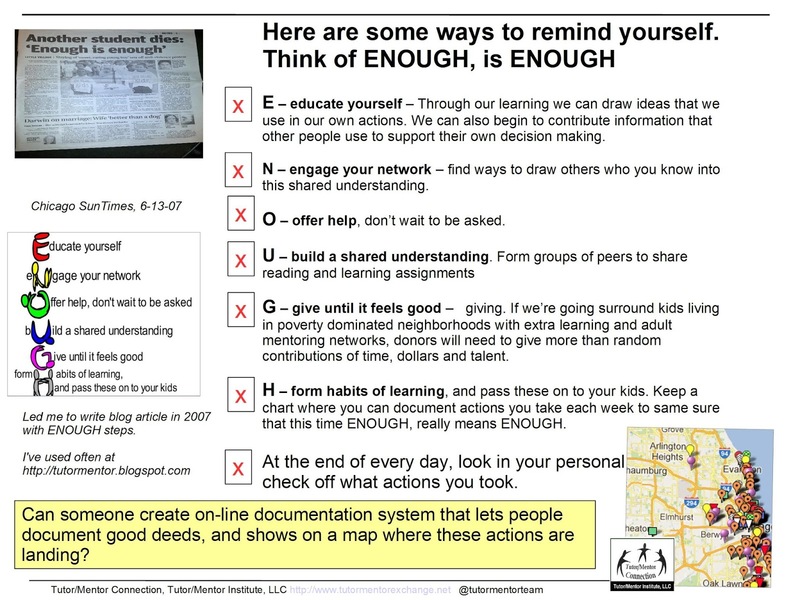 Then, Terry Elliot, another #clmooc friend, who teaches in Kentucky, took time to re-mix Simon's poem, using Lumen5. See it here. This kind of reading and remixing is what I encouraged interns to do between 2005 and 2015. On this site you can see five pages of their work. This is something I encourage anyone who reads this blog to do. Simon's article prompted me to search this blog to find any articles with the "planting seeds" theme. I found one from December 2012 that had many broken links. So I decided to rewrite it. Above I show one of the graphics that was the first frame of an animation done in 2011 by In Hee Cho, an intern from South Korea. 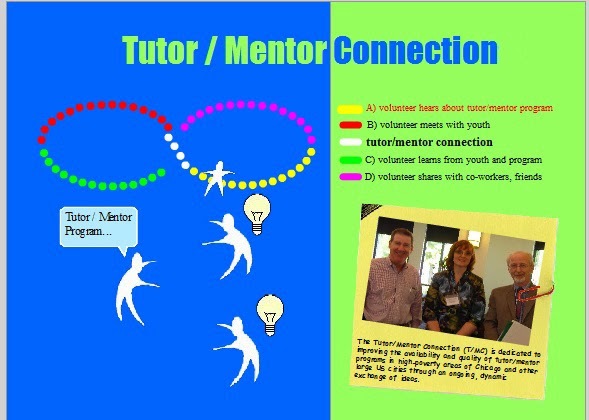 It shows how a volunteer grows into a leader as they stay involved in a tutor/mentor program over many years. You can view the video at this link. My own growth illustrates this. I started tutoring in 1973 when I joined the Montgomery Ward Corporation as an advertising copywriter. I became the volunteer leader of the company program in 1975 and for the next 42 years I've spent time every day trying to figure out ways to attract youth and volunteers and keep them engaged. When I left Wards in 1990 I also had to figure out ways to attract donors and keep them engaged, too, to pay my salary and to pay others who became part of our staff. The original program did not need to worry about this because I and other leaders had full time jobs. We could afford to lead the program as volunteers. 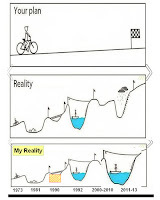 This map shows my journey over the past 42 years. 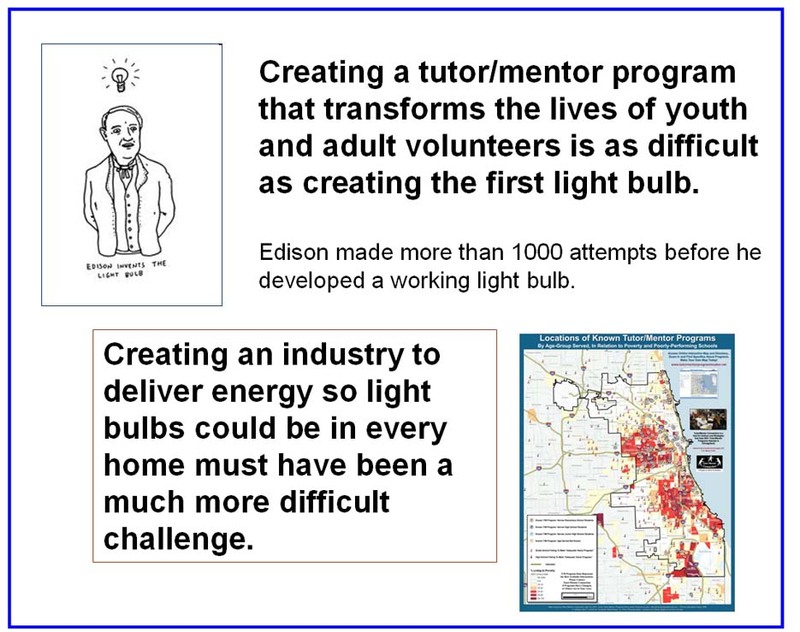 To do this I've tried to educate volunteers, youth, donors, and every other stakeholder by pointing them to information showing where and why tutor/mentor programs are needed and to stories showing the impact of these programs on the lives of kids and adults. This video from the program I led between 1992 and 2011 that tells this story. For those who read the Bible, I would like to compare my work to the Parable of the Sower from Matthew 13 in the Bible. Over 42 years I've spread many seeds inviting current students, volunteers and others to spread the word, inviting others to become involved as tutors, students, leaders, donors, advocates, and have tried to nourish them weekly so that some take root and grow. 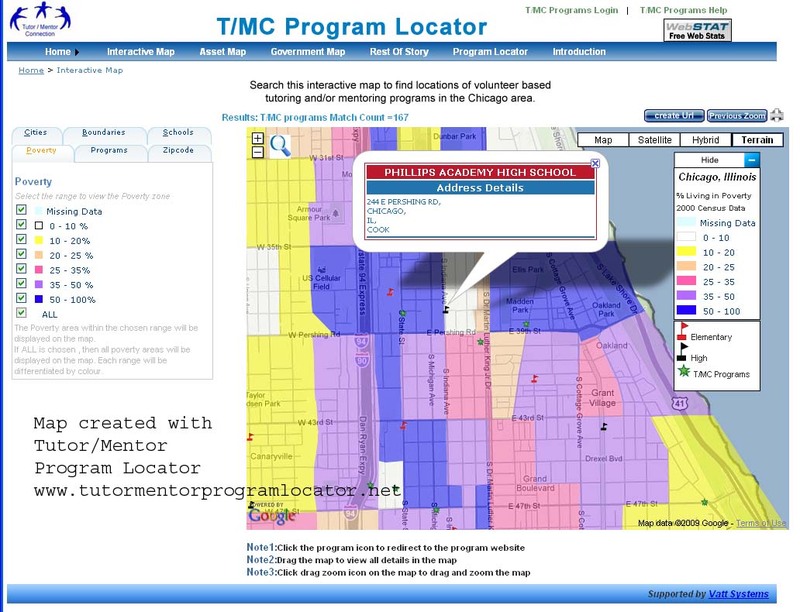 I met a young man at the Chicago Police Department a few years ago who told me he had used the Chicago Tutor/Mentor Program Locator Maps in a college research project, to demonstrate the need for more youth programs in the Englewood neighborhood of Chicago. That's an example of the seeds beginning to take root. A few years ago I received a $2,500 donation from the Women's ProGolf Association. By tracing the donor in my database I found it was a person who I had first started sending newsletters to in 1994. He had changed jobs but it was not until many years later that he could provide financial support. On this page I've posted a few messages I've received from former students, telling of how the tutor/mentor program has impacted their lives. 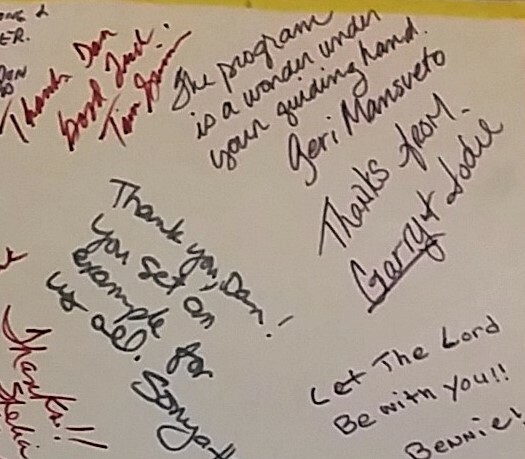 In this article I show "thank you" messages posted by students and volunteers on a 22x28" card given to me in 1990. Thousands of seeds have been planted. Every time I send a newsletter, such as this one, I'm asking people from my past, and who I meet every day, to become active in supporting the work that needs to be done in Chicago and other cities. Every time someone has visited this blog or one of my web sites since 1998 a seed is planted. I created this concept map a year ago to show how friends in the #clmooc network and others have been passing on ideas from this blog to others. That's another example of how the seeds I plant are spread, and how I try to nurture and encourage this. You've heard the phrase "It takes a village to raise a child". My vision is that people in every sector would be adopting ideas I share on this blog and would be re-mixing them, and sharing through their own media, with people in their own network of influence. As some of these seeds take root we should be able to show links in every node on this map, pointing to blogs and web sites of others who are working to support the growth of volunteer-based, non-school and school-based tutor, mentor and learning programs in every high poverty of Chicago and other cities. We should be able to point to businesses and foundations who are providing talent and financial support to help these programs grow, and, to help me continue to spread seeds and nourish their growth. I'm not a non-profit, so you cannot get a tax deduction for helping me. 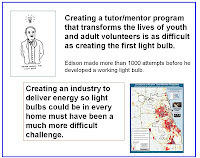 If you want to help me continue to plant and nurture these ideas and spread them to more places, click here to add your support to Tutor/Mentor Institute, LLC, which has kept the Tutor/Mentor Connection resources available since mid 2011. 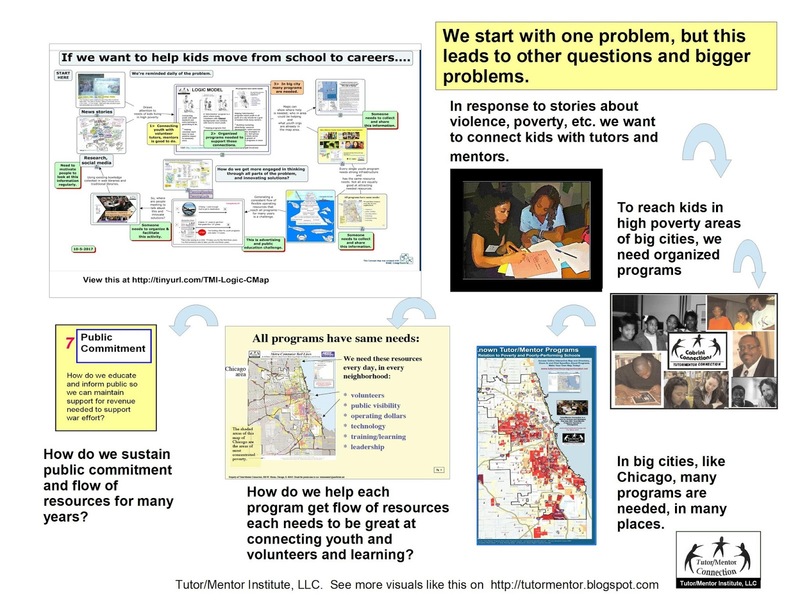 While I need your help, so do many of the tutor and mentor programs operating in Chicago. Click here to find a list of tutor/mentor programs in Chicago that you can choose to support even if you cannot support my own efforts. Thanks for reading. Now, go forth and multiply. If you're creating re-mixes of my articles or presentations just include a link to my site and send me a link so I know what you're doing and can share your work with others.